Gordon Eric Smith was born in Cowley St John, Oxford in 1922. His father Cecil Benjamin Smith was a confectioner, and his mother Lizzie Maria (nee Wallin), a dressmaker. He was born into a large family, with at least ten brothers and sisters, and attended Lord Williams Grammar School in Thame between 1934 and 1938, by which time his family had moved to Wheatley. During 1941 he enlisted with the Royal Artillery, and was posted to the 57th Light AA Regiment based at Doncaster, before embarking for Palestine in September and then, in October 1941, to Egypt. The regiment was assigned to the 4th Indian Infantry during the Operation Crusader battles attempting to hold back the German Africa Corps in Libya. Gordon was serving with the 171st battery, and was captured, and taken prisoner of war. Sometime between the 28th January 1942 and 20th May 1942, 1795499 Gunner Gordon Eric Smith was on an Italian transport ship for Prisoner of War transfer to Europe. The ship was one of a number sunk by torpedoes from British submarines, and Gordon became one of over 800 prisoners of war who lost their lives at sea in the Mediterranean. 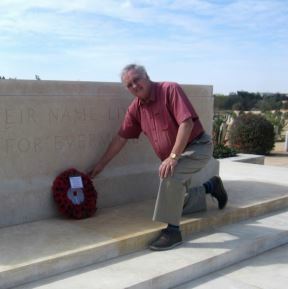 1795499 Gunner Gordon Eric Smith, Royal Artillery, has no known grave and is commemorated on the El Alamein Memorial in Egypt. He is remembered in Thame, Gordon on the Lord Williams’s school memorial board, and he is also commemorated on the Wheatley war memorial. His brother Frederick served in the RAF and died on 30th October 1943.